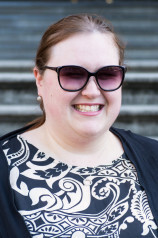 Fulbrighter Ailsa Lipscombe, 2015 Fulbright New Zealand General Graduate Awards grantee, is a finalist in the Spirit of Attitude category in the 2015 Attitude Awards. Ailsa is currently in Chicago with her guide dog Connie, where she is completing her PhD in Music, specialising in the way contemporary musicology intersects with narrative studies at the University of Chicago, Illinois. Ailsa Lipscombe (23) is in pain every day, but that hasn’t stopped her singing her way to America and supporting others with disabilities. The Wellington musician is a finalist in the Spirit of Attitude category in the 2015 Attitude Awards. The national awards celebrate the excellence and achievements of Kiwis with a disability. Ailsa lives with Complex Regional Pain Syndrome (CRPS), a nerve condition which means she’s in constant pain, particularly in her arms and legs. Since developing CPRS in 2005 Ailsa has been affected by severe vision loss and mobility problems. She is now legally blind and was in a wheelchair for four years before learning to walk independently again. But Ailsa’s spirit has outsung all her physical challenges. As a soprano vocalist and trained classical singer, Ailsa completed a Master of Music from the New Zealand School of Music. Then earlier this year she was awarded a Fulbright scholarship to undertake her PhD at the University of Chicago. “My journey to this point has not been easy, as many of those living with disability will understand,” she says. Throughout high school Ailsa found it difficult to be included and accommodated for. She was even told she couldn’t sit her exams due to absences, despite studying from hospital. She went on to have a better experience at university, but she knows how lucky she was to find the support and understanding that she needed. “I have faced a lot of adversity in the community, education system, and within friendship and family networks, and for many years I battled with a sense of hopelessness that came along with these challenges,” says Ailsa. Her experiences have ignited a passion for inclusive education and Ailsa is helping others to achieve their education goals. She tutors students with dyslexia and autism as well as being an academic mentor in the Te Putahi Atawhai programme at Victoria University. Ailsa has also worked with disability services to help improve their systems and support for university students with disabilities. Her goal is to return to New Zealand with her PhD and work as a university lecturer. Ailsa wants to lead by example for students and to change perceptions of disability when it comes to education and musicianship. Ailsa left for Chicago on September 12 and the announcement as an Attitude Awards finalist was a fitting send-off. “To be recognised as someone who shows a sense of spirit is really uplifting and rewarding,” she says. Ailsa won’t be able to attend the Attitude Awards black-tie gala on World Disability Day, December 3 at Auckland’s Viaduct Events Centre, but her mother and sister will be there to find out if she’s won. There are eight categories in the 2015 Attitude Awards: Courage in Sport, Spirit of Attitude, Making a Difference, Artistic Achievement, Youth, Junior, the Attitude ACC Employer Award and Sport Performer of the Year. The overall winner of the Attitude ACC Supreme Award is selected from the category winners and a People’s Choice winner and Hall of Fame inductee are also announced on the night. The Spirit of Attitude Award is sponsored by Drake Medox. Gay Barton, National Manager for Drake Medox New Zealand and Australia says Drake Medox is proud to again be supporting the Spirit of Attitude Award. Other sponsors supporting the Awards include: ACC, Westpac, Ministry of Health, Barfoot & Thompson, IHC Foundation, Air New Zealand, Lion Foundation, Invacare and the Wayne Francis Charitable Trust. Chief Executive of ACC Scott Pickering says ACC is proud to be principal sponsor of the awards for the eighth year, including sponsorship of the Attitude ACC Employer Award and the Attitude ACC Supreme Award. This article about 2015 Fulbright New Zealand General Graduate Award grantee Ailsa Lipscombe is republished with permission from Attitude Live.